Columbus stumbled upon the New world while seeking the riches of the Orient, yet native peoples of the Americas already held riches beyond his knowing. From maize to potatoes to native beans, a variety of crops unknown to Europeans was being cultivated by indigenous peoples of teh Americas. 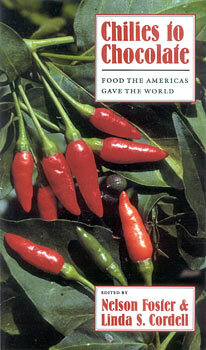 Featuring contributions by Gary Nabhan, Alan Davidson, and others, Chilies to Chocolate traces the biological and cultural history of some of these crops, focusing on their domestication and use by native peoples and their dispersion into the fields and kitchens of the Old World. "From the discovery of vanilla to how chilies spread since Columbus, this is packed with culinary lore and regional history, and will complement the shelf of any food enthusiast who loves history."